Unresolved conflict costs a lot more than just money. Our workplace mediation services resolve complex and challenging disputes swiftly, effectively and with as little disruption as possible. Our team of expert and experienced workplace mediators work with all parties in a dispute to establish their underlying needs and interests, encourage dialogue and ultimately, facilitate a mutually acceptable resolution. In most cases, mediation lasts for one full day. 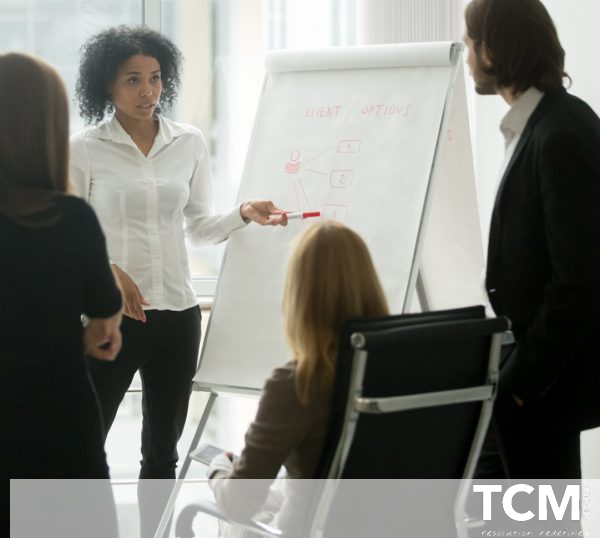 Experience has shown us that entrenched positions can be adopted when problems are overlooked or inflamed, whereas a fully-trained and skilled TCM mediator can help your employees move towards a more constructive and satisfactory resolution. We resolve 93% of disputes referred to us and these typically involve complex issues such as grievances, complaints and allegations of bullying, and harassment. What issues are suitable for mediation? Mediation is suitable for every single complaint, quarrel, disagreement and feud. Every dispute that you could imagine, and probably a few that you couldn’t, are suitable for mediation. There is no conflict that can occur in the workplace that mediation could not help with. TCM has been delivering mediation services for a wide array of organisations since 2001. We were recently awarded ‘Mediation Provider of the Year‘ by the Civil Mediation Council during the National Mediation Awards. 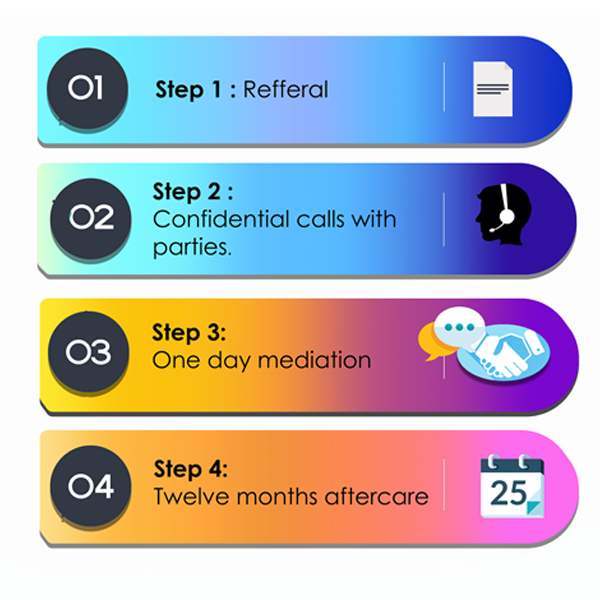 TCM designed and delivers a highly effective workplace and employment mediation process called FAIR Mediation™ – see below. FAIR Mediation™ is suitable for a wide range of issues. Conflicts and disagreements between employees and within teams. Conflicts between managers and employees or between senior managers. Boardroom and executive level disputes. Disputes with customers or along the supply chain. Issues arising from mergers and acquisitions. Save time, money and stress with mediation. Last year, the team at TCM achieved a successful resolution in over 90% of the disputes referred to us*. 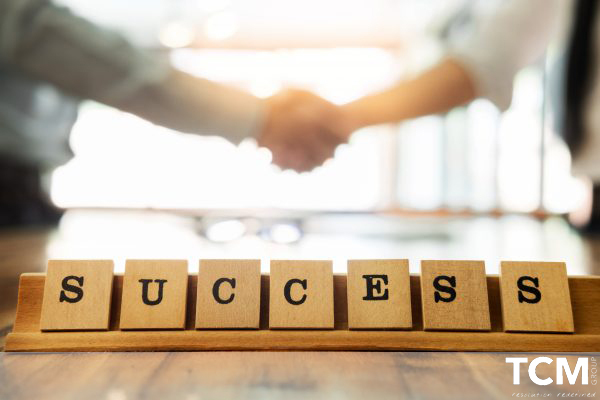 This is an unprecedented success rate in mediation and is due to the commitment that we have at all stages of the process. Mediation places responsibility for the resolution of a dispute directly with the parties. Mediation creates a safe place for all sides to have their say and to be heard. Mediation stops disputes escalating out of control. Mediation reduces the stress and anxiety commonly associated with conflict. Mediation reduces the cost of conflict and reduces the risk of litigation. Mediation contributes to a more harmonious and productive working environment. *our success rate is based on the parties achieving a signed agreement by the end of mediation. One of the TCM business support team will liaise with you to agree dates and logistics. The case is allocated to one of our expert mediation consultants. They will contact both parties by phone or videocall to introduce themselves and to answer any questions that they may have. On the day of mediation, the mediator will meet each party separately for about an hour. This meeting is to explore the past and the present. The mediator then meets the parties a second time to help them prepare for the joint meeting. Parties make an opening statement followed by questions and summary by the mediator. Parties have an open and free flowing exchange of views. The mediator shifts the focus from past to the future. The parties are encouraged to begin problem solving and developing their resolution action plan (RAP). The mediator will test the RAP to ensure that it is resilient and sustainable. The mediation is closed and all parties agree what happens next. We will contact you to make sure that you are happy with how mediation proceeded and we will clarify the aftercare and follow up arrangements. How can I become a trained mediator? 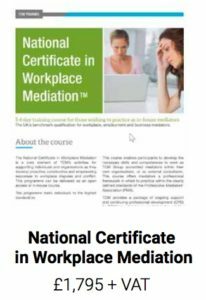 This course is the flagship training for workplace mediators. It is accredited by the Open College Network (OCN). Since 2001, we have trained mediators from all over the world who have used their skills to resolve complex workplace conflicts, complaints and disputes. The course is available for delivery onsite at your organisation from groups of 8 or more. We also run the course regularly through the award winning TCM Academy in Central London. This is a fantastic one day course. It is designed for line managers, supervisors, complaints handlers, union reps and HR and ER advisers who may benefit from using mediation skills as part of their everyday jobs. The skills that we teach are universally valuable and include empathy, applied positive psychology, communication skills, assertiveness, problem solving and negotiation skills. This is a wonderful way for delegates to learn from some of the worlds top mediators. Delegate feedback from this course is always outstanding. Like Practical Mediation Skills™, it works best as an in-house course which means that we can tailor it to your specific needs and context. However, we also run it as an open course through The TCM Academy. Is mediation confidential? Yes, whatever is said during mediation goes no further. All notes taken in mediation are destroyed. Is mediation voluntary? Yes it is. Although, more and more of our customers are making it clear that they expect their employees to act in a reasonable way to secure a constructive resolution to a complaint or a grievance. Does mediation work in a team? Yes, mediation is highly effective at resolving team or group conflicts, click here for more details. 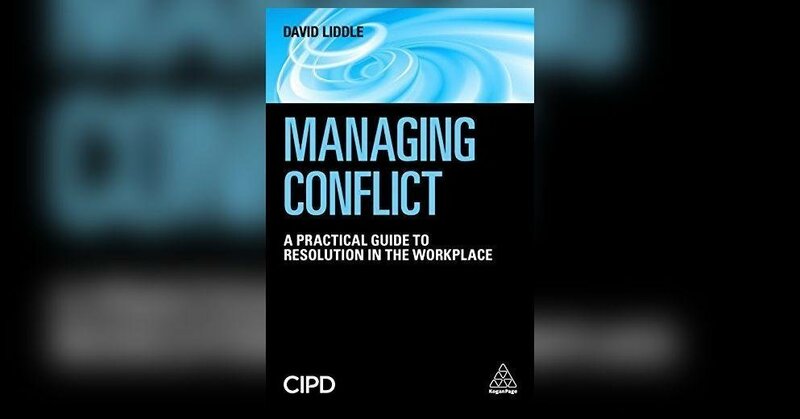 David Liddle’s book ‘MANAGING CONFLICT‘, published by Kogan Page and the CIPD, includes a significant amount of resources for organisations interested in using mediation. 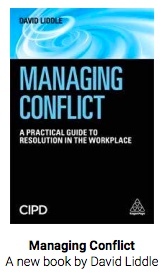 Order MANAGING CONFLICT from Amazon. 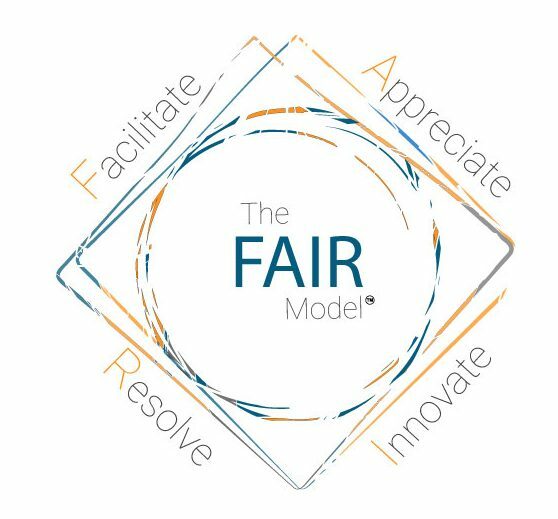 TCM’s FAIR Mediation Model™ has been designed specifically for use in resolving workplace and employment disputes. It is a highly effective and well regarded model used by some of the UK’s biggest names including: Royal Mail, HSBC, Aviva, Network Rail, BA, London Ambulance Service, Lloyds Banking Group, The Metropolitan Police, BT, The DWP along with numerous universities, hospitals, councils and police forces. The FAIR Mediation Model™ is unique because it addresses the underlying root cause of a conflict whilst bringing a pragmatic and highly effective problem solving approach. It also includes a substantial amount of post-mediation support for the parties for a full year after mediation concludes. “Mediation is a non-adversarial way of resolving difficult situations. It is used as an alternative to formal or legal processes. At TCM, we describe mediation as a mind-set; a framework; and a competence. The mediator is an impartial third party. They help the two or more disputing parties to have an open and honest dialogue so that they can secure a mutually acceptable outcome. A win/win outcome. Mediation is different because it is about collaborating rather than blaming. How to find out more about workplace mediation? You are welcome to contact us with any type of mediation related enquiry. We are passionate and knowledgeable about mediation and we welcome any questions that you have. If you would like to know more about mediation, we can visit you to deliver a free ‘Mediation Eye Opener’ workshop for up to 16 delegates. During the workshop we will explain how mediation works and we will answer any questions that you have. For more information call 0800 294 97 87 or email us here. 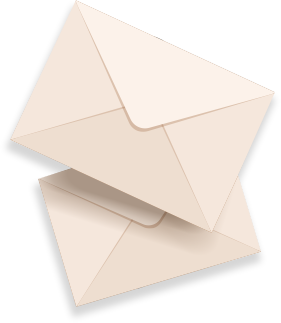 If you would like to discuss any aspect of mediation, or you are interested in referring a case to TCM, please contact us now. Our mediation experts are on hand to provide confidential and no obligation advice.